Slipping comfortably onto the meat bandwagon that has been trending in the restaurant scene of late is Blue Butcher, an eye-catching new establishment from the people behind PLAY and the Mexican-themed Brickhouse. 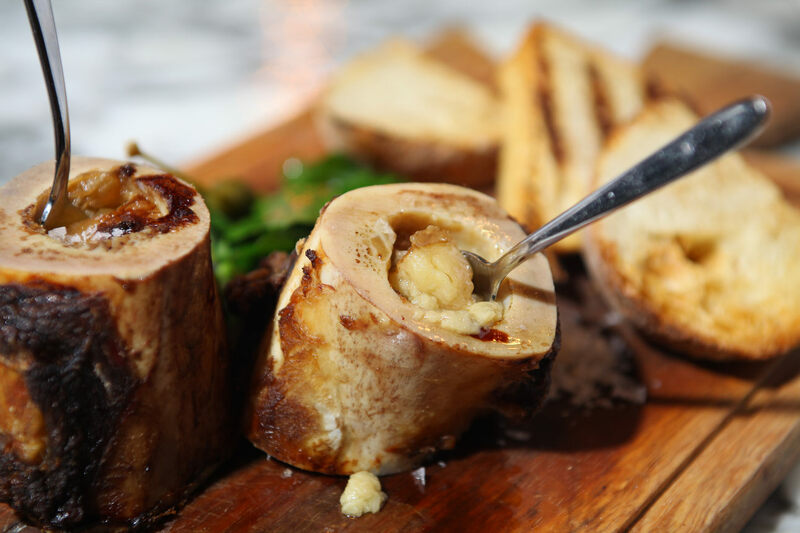 However, instead of just sitting on the bandwagon, the folks at Blue Butcher are shaking it around, with the restaurant touting itself a ‘meat specialist,’ rather than a steakhouse. This is not without good reason, as they are the only restaurant equipped with a walk-in pink salt dry aging room in Hong Kong. The practiced chefs prepare, bake, age, and hang everything in-house using age-old recipes and modern techniques. They also use the freshest produce and herbs from local organic farms, with a menu of unique and award-winning cocktails standing out as well. However, the mouthwatering protein on offer is but one of the restaurant’s appeals, with the main enticement of Blue Butcher being the eccentric nostalgic design scheme. 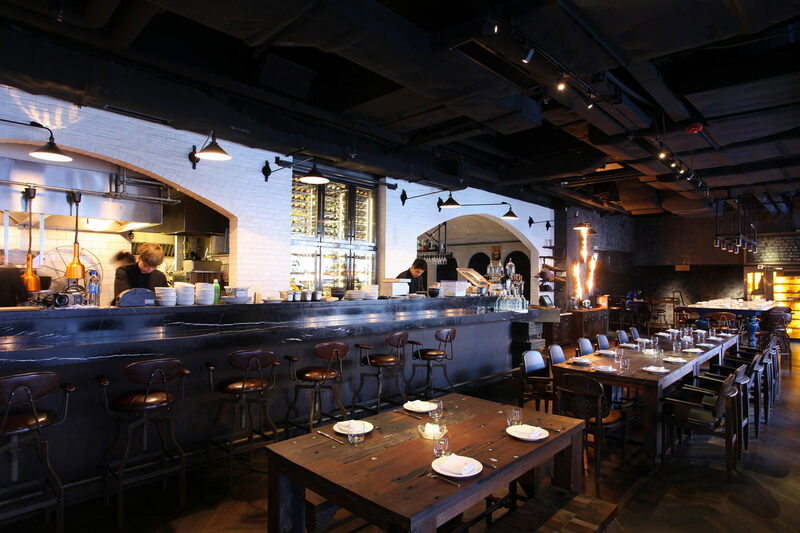 Taking cues from the hip eateries in Manhattan’s Meatpacking District, the restaurant is full of dark woods and metals which have been made to look like they are on the verge corroding and oxidizing. These elements match the distinct New York-style décor and ambience, which mixes old railway motifs with a rustic 1920s speakeasy vibe. On the ground floor wooden decking resembling crate boxes makes for a relaxing outdoor space, while a large iron door encourages one to explore the quirky interior further. Further into the restaurant on the ground floor are distinctive floor tiles which would not be out of place in one of the ‘Saw’ movies, and there is also ironic text tiled onto the floor which spells out, ‘Pleased to meat you.’ More tiles appear on the wall further in as well near a small bar and an idiosyncratic staircase, which would make a great backdrop for a ‘Die Hard’ fight scene. 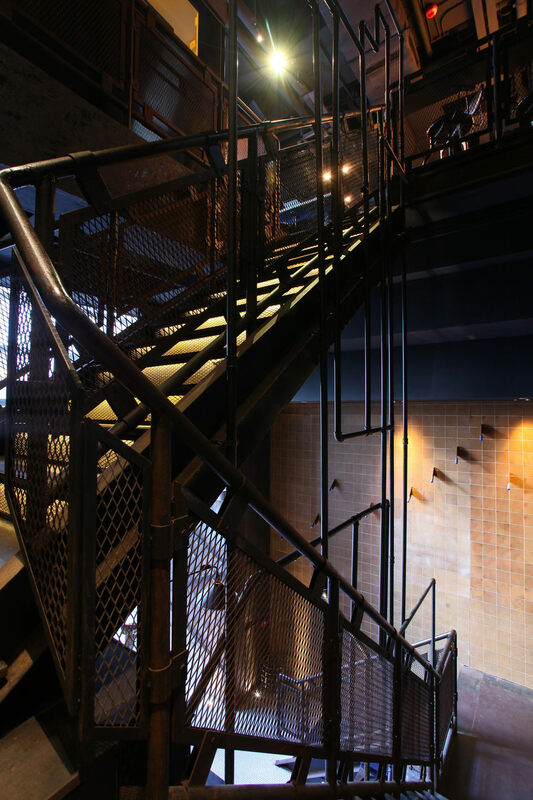 Up the illuminated stairs on the first floor of the restaurant the space opens up where high, dark ceilings stand out alongside polished wooden floors and antiqued-looking leather furniture. There is also an open kitchen and hefty farmhouse-style wooden tables, which look like butchers have been preparing meat on them for years. Around this main dining area idiosyncratic ornaments and fittings also complement the subtle steampunk vibe, with old-school typewriters, dated leftover machine parts, overhanging lamps and brick upping the rusticity. There is also a room for private parties, which features white-painted bricking complete with rough recesses for candles and two chandeliers made mainly out of dangerous-looking artificial knives (private guests are probably more likely to be able to afford insurance). When these attention-grabbing design elements are matched with their finely-prepared slabs of protein, the exclusive cocktail list and the unusual dishes such as Pig’s Head Terrine, Rare Breed US Kurobuta Pig Belly and Cheek, plus a top-quality Red Label French Quercy Lamb shoulder, one cannot deny that there is something special going on here. Here’s to hoping we all get the chance to ‘meat,’ greet, and experience the restaurant soon.